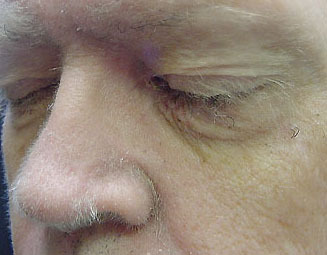 Hypertrichosis lanuginosa acquisita is also referred to as 'acquired hypertrichosis lanuginosa' and 'malignant down'. This is a cutaneous sign of internal malignancy, most commonly associated with malignant neoplasms of the upper aerodigestive tract, but other malignancies have been associated with the condition, too. In this particular case the patient refused additional work up and was lost to follow up, but it was presumed that he has a pulmonary malignancy. What is hypertrichosis lanuginosa acquisita? Hypertrichosis lanuginosa acquisita is a very rare condition characterized by the rapid growth of long, fine, lanugo-type (i.e. : fetal) hair particularly around the eyebrows, forehead, ears and nose. It is similar to congenital hypertrichosis lanuginosa (see hypertrichosis) except that it appears later on in adulthood and in most cases associated with an underlying cancer. Although the face is the most commonly affected area, some patients have extensive involvement that includes the trunk, axillae and extremities. Palms, soles, scalp and pubic regions tend to be spared. The hair referred to as 'malignant down' is fine, thin and unpigmented. Lanugo hairs are normally present from the third month of fetal life through to the end of gestation and are shed almost completely before birth. Other associated symptoms include glossitis, a bumpy enlarged tongue, disturbances of taste and smell, and, less frequently, diarrhea, weight loss, and enlarged lymph glands. Other paraneoplastic skin conditions that may also occur include acquired ichthyosis, acanthosis nigricans, and tripe palms. What is the cause of hypertrichosis lanuginosa acquisita? The cause of hypertrichosis lanuginosa acquisita is unknown but it is thought to be in response to hormones or substances released by the tumor. 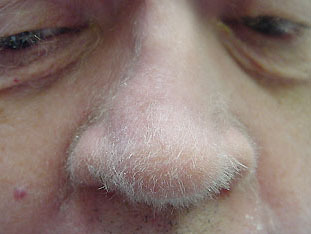 Most cases of hypertrichosis lanuginosa acquisita are associated with an internal malignancy. The most frequently associated cancers include lung, breast and uterine cancers, colorectal cancer, lymphoma, and bladder cancer. The 'malignant down' most often occurs late in the course of the cancer, however in some cases it may be the presenting sign of a tumor and can appear up to 2 years prior to diagnosis of cancer. Less commonly, hypertrichosis lanuginosa acquisita is associated with non-malignant disease such as anorexia nervosa, hyperthyroidism, and acquired immune deficiency syndrome (AIDS) associated with human immunodeficiency virus infection (HIV). It may also be a side effect of drugs such as cyclosporine, phenytoin, interferon, spironolactone, and corticosteroids. Malignant forms of hypertrichosis lanuginosa acquisita look exactly the same as those cases associated with harmless diseases or drugs. Hence it is important that when non-malignant causes have been ruled out, patients undergo comprehensive screening and careful monitoring to detect any associated malignancy. Washington University School of Medicine Case of the Month, 2005. 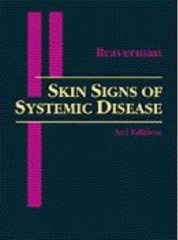 Skin Signes of Internal Disease. Braverman.